Oswaldo Vigas (Venezuelan, 1923-2014). Oil on canvas. 39 ¼ x 22 ½ inches. Courtesy of the Oswaldo Vigas Foundation. Oswaldo Vigas: Transformations presents the first American survey of artist Oswaldo Vigas (Venezuelan, 1923-2014). Organized by the Grand Rapids Art Museum, the exhibition examines Vigas’ influential career and his contributions to 20th-century modernism. 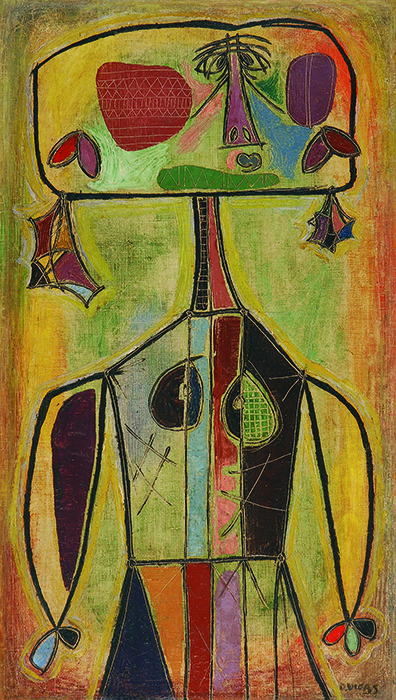 A prolific artist, Vigas found inspiration in both the natural landscape of his native Venezuela and the European avant-garde. Oswaldo Vigas: Transformations focuses on works created between 1940 and 1980, and demonstrates the evolution of Vigas’ distinct artistic style. In the late 1940s, Vigas focused on figurative abstraction and created his vibrant series of Bruja (or witch) paintings. 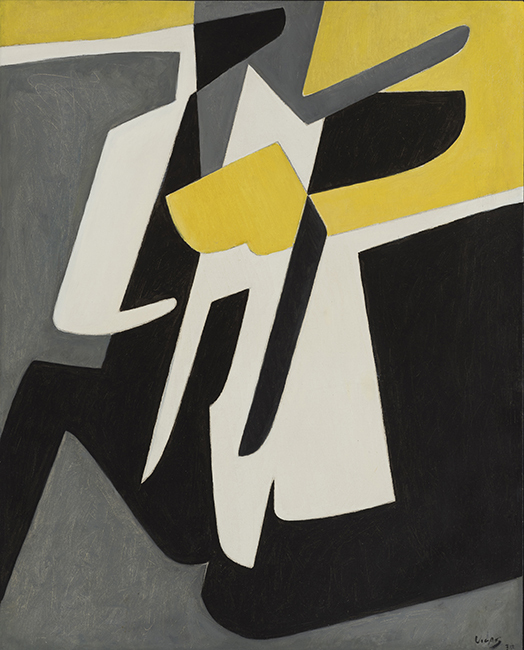 Cubism and constructivism influenced Vigas and by the 1950s, he shifted away from figuration and moved towards geometric abstraction. The works on view illustrate the scope of Vigas’ projects, from studio painter to muralist, and highlight the importance of his creative achievements. Born in 1923 in Valencia, Venezuela, Vigas studied medicine at Universidad de los Andes (ULA) in Mérida, Venezuela. In the 1950s, he gave up his medical practice to focus on his artwork. Vigas spent the next decade working and exhibiting his work in Paris, France. 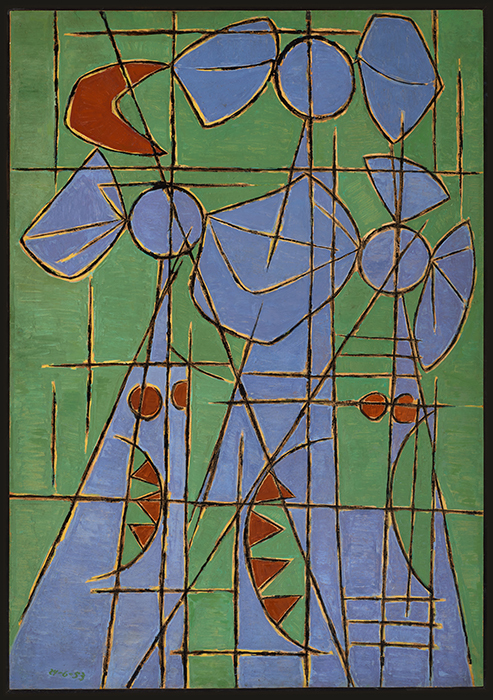 Vigas is celebrated as one of Latin America’s preeminent 20th-century painters, alongside artists such as Roberto Burle Marx, Wifredo Lam, and Rufino Tamayo. Vigas’ work has been featured in exhibitions around the globe and resides in prominent private and museum collections including the San Francisco Museum of Modern Art; Museum of Fine Arts, Houston; and the Art Museum of the Americas. Vigas passed away in 2014 in Caracas, Venezuela. Oswaldo Vigas (Venezuelan, 1923-2014). Oil on paper glued on Masonite. 42 ½ x 29 ½ inches. Courtesy of the Oswaldo Vigas Foundation. Oswaldo Vigas (Venezuelan, 1923-2014). Oil on canvas. 39 3/8 x 21 ½ inches. Courtesy of the Oswaldo Vigas Foundation.